The nature of central Russia is a favorite theme in the canvases of Ilya Semenovich Ostroukhov. He painted landscapes passionately and enthusiastically. On his canvases you can see all the seasons. But the artist gave particular preference to autumn. “Autumn Landscape” – not the most famous work of Ostroukhov. There are many others, as it is now fashionable to say “untwisted” paintings. 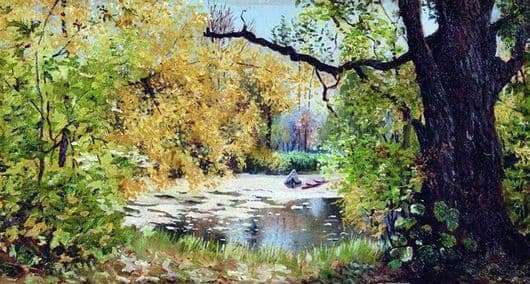 Only people very far from fine art did not see Ostroukhovskie “Golden Autumn” or “In Abramtsevo Park”. Why the “Autumn Landscape” did not deserve such popularity, to be honest, it is surprising. Perhaps because the Russian people associate the beauty of autumn with Pushkin’s lines: “In the scarlet and gold-clad woods…”. In fact, in this canvas, the viewer does not see the riot of autumn colors. The picture is dominated by green. However, this canvas is unusual in itself. The viewer, as if walking along the path to an abandoned pond. The dark tree on the right, stretching its branch parallel to the upper part of the picture, the bright shrubs that have retained their outfit on the left, the foliage of which crumbles into the lower part – all this creates a kind of “frame” in which the water surface is enclosed. This is a kind of picture in the picture. At the same time, the picture does not look dull and does not evoke sad thoughts. It only opens the window to the winter, inviting the viewer to enjoy the last warm days of the Central Russian “Indian summer” and enjoy the coming winter, which will also bring positive emotions.